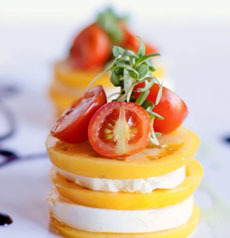  Yellow tomato Caprese Salad (photo courtesy Elegant Affairs Caterers | FB. Artistic Caprese Salad (photo courtesy Great Performances | FB). 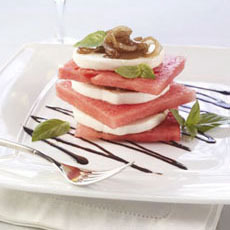 Watermelon Caprese Salad. You can also use mango and other stone fruits (photo courtesy Watermelon.org). On the hot days of summer, lighten up on your cheeses. Switch the heavier blues, cheddars and washed rind cheeses for delicate, creamy ones. Even fresh year-round cheeses like chèvre, feta, mozzarella and ricotta taste better in the summer. Cheeses are seasonal based on the feed and milk availability. Goats and sheep, for example, cease producing milk over the winter, when they have bred, until they give birth.in spring. With modern freezing techniques to preserve the curds, goat’s and sheep’s milk curds, previously available only in spring when the animals give birth, are available year-round. In the spring and summer, the animals from artisan cheesemakers graze in the field, eating grass and clover. The seasonal diet gives more dimension to their milk, with floral and grassy notes. Fresh curds + richer milk = the best cheese of the year. No one will stop you from getting your fill of aged Gouda, Roquefort or Stilton, but we prefer to save them for the cooler months. All pair with burgers, pizza, green salads and fruit salads. Make grilled cheese sandwiches or panini. Toss with pasta and salads (ciliegine and perlini, bite-size mozzarella balls, work better here). For appetizers and the summer “cheese course,” combine ciliegine with cherry tomatoes and other vegetables, cubed meats or rolled proscuitto. Use skewers or an artistic plating. For dessert, do the same with fruit. 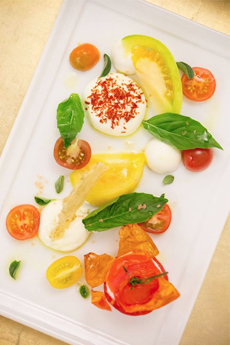 And get your fill of perhaps the most famous summer mozzarella dish, Caprese Salad. You can substitute mango, stone fruit or watermelon for the the tomatoes. You can substitute feta, goat cheese, ricotta, even tofu for the mozzarella. Best Fresh Herb Pairing: basil. Feta—crumbled, cubed or sliced—pairs with almost every summer fruit and vegetable. Tip: Some feta is very salty. Go to the cheese counter and ask to taste it first, or get a recommendation for a packaged brand with less salt. In Watermelon-Feta Salad or crumbled over green salad. With grilled lamb, pork or poultry (turn it into a side with good olive oil, cherry tomatoes and fresh herbs). On burgers: beef, turkey and especially lamb. On pizza, anchovies, capers, olives and onion slices. Best Fresh Herb Pairing: cilantro or dill. Fresh goat cheese is soft and creamy, with a bit of tang. Along with ricotta, it spreads easily on bread. On crusty baguette, with tomatoes or grilled vegetables. With green salads (slice a log into rounds and place on top of the greens. Ditto with fruit salads or a fresh fruit plate. Best Fresh Herb Pairing: basil or mint. Soft and creamy ricotta is can be called “Italian cottage cheese,” and can be used in the same ways. You can mix in any seasonings and use the flavored cheese in even more ways. Ricotta loves a drizzle of honey. Spread on toast and bagels, with optional honey or berries. 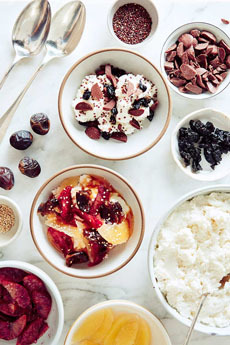 DIY ricotta bowls for breakfast or dessert (see photo #4). Substitute for mozzarella in a Caprese Salad. Pair with fresh fruit and optional yogurt. Sweeten for cookie sandwiches or dips. Use the cannoli cream instead of whipped cream to top fruit, puddings and other desserts. Best Fresh Herb Pairing: chives. Test your knowledge—or build it up—with our Cheese Glossary: the different types of cheese, categories, techniques, etc. 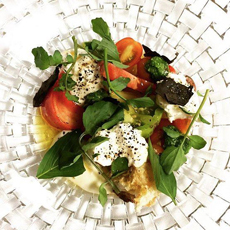 Top a salad with a spoonful or two of plain or flavored ricotta (photo courtesy Del Posto | NYC). DIY ricotta bowls are customized to whatever you want: fruit, seeds, even chocolate (photo courtesy Good Eggs | SF).